Riverby is a ’boutique’ estate whose vineyards occupy a prime position on Marlborough’s Jacksons Road, next door to the iconic Cloudy Bay. Unlike Cloudy Bay, which is owned by global luxury good giant LVMH, Riverby’s vineyards are owned by the same family who have farmed this land for over 100 years, and only estate-grown fruit is used. Riverby is the historic name of the farm, after the Opawa River and its tributaries that criss-crossed the property. When the river was diverted in the 1930s, the ideal grape growing land was created, with its free-draining stony soils. The vineyards are worked sustainably, with carefully controlled yields and several blocks harvested by hand. First planted to vine in 1989, the portfolio is broad: not just Marlborough’s holy trinity of Sauvignon, Chardonnay and Pinot Noir, but Riesling is a major focus along with Pinot Gris, Gewurztraminer, Grüner Veltliner, Semillon and Syrah. The Chardonnay and some of the Sauvignon Blanc are planted on their own roots, not on American rootstock. I was lucky enough to have MD of Riverby, Kevin Courtney, attend my 2016 Glasgow Festival of Wine and deliver a Riesling masterclass, but it’s an absolute joy that Kevin is returning both for the 2017 Glasgow Festival in June, this time delivering a masterclass on his award-winning Pinot Noir wines, and then to the 2017 London Festival in October. In advance of that, Kevin and his UK distributor Black Dog Wine Agency sent me all of his current releases to try for myself. These are terrific wines, all very carefully made with a great purity and balance shown throughout the range: nothing is excessive, but everything is precise and intense. Kevin’s policy is to carefully control yields in the vineyard, and that shows in the concentration of these wines. No wonder they are picking up more and more plaudits from critics and in major competitions. (2017) The hallmark of all of these Riverby wines is a lovely blend of restraint and elegance, with more vivacious and ebullient fruit character, and so it is with this Sauvignon: make no mistake, this is vivacious and bears its Marlborough signature of green bean and asparagus pungency along with tropical fruit exoticism, but there's a rounding, lightly savoury aspect too. Cropped low so that it is intense, 4g/l of residual sugar adds some mouthfeel and fat but not perceptible sweetness. (2017) The blend is 70% Sauvignon Blanc and 30% Semillon, the Semillon (and a small portion of the Sauvignon) fermented and matured in new French oak for eight months. Oak does not show on the nose, in fact it is the asparagus and green bean pungency of the Jacksons Road Sauvignon from Kevin's best block that sings out, just a hint of custard and delicate spice beneath perhaps. In the mouth the Semillon certainly adds texture, and flavour, creaminess, spice and butter layered with the bold Sauvignon gooseberry and grapefruit. Long and intensely concentrated. (2017) Riverby Estate's Chardonnay block was planted in 1989, making it one of the oldest Chardonnay blocks in Marlborough. Like all the wines in this range there's a joyous blend of restraint and approachability in this lovely wine: only 12.5% alcohol means it is crisply focused with excellent acidity, yet the fruit is ripe and bountiful, 12 months fermentation and ageing in French oak plus three more years in bottle giving nutty, golden-hued depth. It is indeed 'Burgundian' in many ways, a hint of flintiness in there too, and is supremely enjoyable. 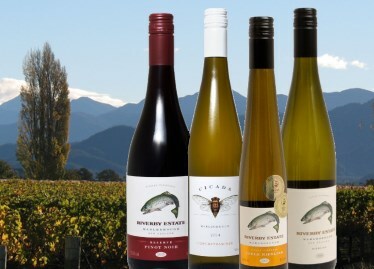 (2017) Riverby's Riesling vineyard is one of the oldest in Marlborough, and this 2011 wine is in a perfect place, the nose showing a gentle waxiness, pollen, and a lime peel touch of both citrus and exotic fruit. In the mouth it brims with apple fruit, definitely on the dry spectrum, but not the austerity of Eden Valley Riesling for example with just a touch of sweetness and a more waxy and generous, quite broad texture too. (2017) Another delicious Riesling this, off-dry and peachy to the nth degree, it comes from one of the oldest vineyard blocks that regularly develops a little botrytis. As well as peach, a touch of candle wax and lime skins, there's a hint of smoky minerals and a hint of floral top-note in quite a complex aromatic profile. The palate is grapefruity and tangy, the hint of sweetness offset by lots of pithy citrus cut, finishing with lots of zest and bittersweet grapefruit in a hugely quaffable style. (2017) Would I class this as semi-sweet or fully sweet? It's probably somewhere in upper Spätlese to Auslese territory (in fact, Kevin tells me it has 38/gl of residual sugar), but is a truly glorious Riesling, brimming with sweet nectarine and mango, a definite touch of Botrytis honey and barley sugar, and a zesty touch of lime peel. It has such luscious fruit sweetness on the palate, more of that peach and apricot flesh juiciness, tropical notes, and a riveting core of grapefruit acidity. It's easy to over-mark sweeter wines, but this is incredibly well done and utterly delicious. (2017) Austria's Grüner Veltliner is gaining some traction in southern hemisphere vineyards - I reported recently on a small enclave in Australia's Adelaide Hills - but Marlborough has also taken to the variety. Only the third vintage for Riverby, this has succulent pear on the nose, limey citrus and a hint of mineral salts. There's a delicious weight to the fruit on the palate, texture and silkiness, the sheerness of the citrus acidity sweeps through, cutting rather more tropical fruit flavours to finish dry. A really very good expression of Gru-V. Note: price and stockist quoted at time of review is for the 2014 vintage. (2017) Another beautifully realised expression of its variety, this is more Alsace than Veneto in style certainly, with ripeness, weight and texture, but Riverby has done a great job in tempering that spicy, ripe, succulent pear weight of fruit with cleansing and accurate acidity, pithy and apple-core dry, which against the burgeoning sweetness of fruit is absolutely delightful. (2017) My first tasting of a Gewurz from Riverby and it is a very good one. Cicada is an occasional brand used by Kevin Courtney when a wine is made from purchased, rather than estate-grown, fruit. This is made in an unashamedly opulent style, all about aromatics, sweetness and full, fat texture in the mouth. Classic aromas of Turkish delight and talcum, rose petal and some waxy exotic fruit peel lead on to a mouth-filling, spicy wine where the expansiveness of the flavour and texture is matched by very good acidity as the spiciness of the variety powers through. A banker for spicy Szechwan or Thai food, maybe even light fruity desserts. (2017) A few rows in one of Riverby's prime Riesling vineyards have a track record of developing 'The Noble Rot' and so are left on the vine long after the regular harvest. This is unoaked, the full aromatic panoply of beeswax, nectarine, more exotic mango and intense honey and barley sugar allowed to really sing. In the mouth the intensity gives this 11% alcohol wine huge presence: concentrated and sweet with 200g/l residual sugar, the luscious peach and nectarine, sliced through by a delicate but absolutely authoritative lime acidity. Terrific. Price for a half bottle and note: price and stockist quoted at time of review is for the 2014 vintage and if you are lucky enough to fly Air New Zealand Business Class, you can try it there. (2017) A delightful cherry and clove spice-scented Pinot, made from various clones, some planted more than 20 years ago. A year in French oak barrels (though only around one-third new) has softened the wine without dominating, allowing a free-flowing juiciness to take centre stage, with a touch of briary, woodlandy earthiness and a nicely taut and elegant framework of tannins and more cherry in the acidity. (2017) A selection of the best barrels of Pinot, made with fruit from the best blocks, is given a little extra time in barrel and a higher proportion of new oak. Although also a different vintage to the regular Pinot, the family resemblance is clear, with a similar profile of cherry and exotic spice, just a little extra touch of tobacco and briar from 15 months in barrel. The colour has that lovely transparency of Pinot that has not been over-done, the palate the same winning combination of agile fruit and briskness to the structure, just a touch more concentration and creaminess. At time of review Blackdog Wine Agency only has magnums at £55 on sale.